Yes, well, this is a mechanical pencil blog so even though it’s seemingly always referred to as the Rotring Newton Trio Pen, I am going to call it pen / pencil. After all this review will be with a pencil bias, not pen. 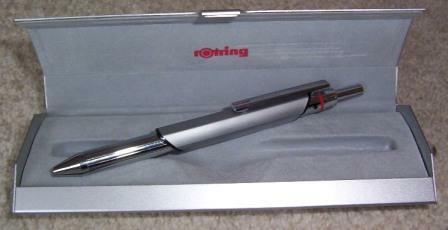 The Rotring Newton is named after Sir Isaac Newton, the great 17th Century physicist, scientist and “thinker”. Personally I find the look of the Trio rather reflective of this idea. The round metal body has longitudinal lines along it and is shiny chrome plated, unlike the central “sleeve” section which is matt. Viewed side on, the hexagonal sleeve section looks as though it is a part of an equilateral triangle and the pocket clip attachment continues this triangular line. It all combines so the whole look of this pen/pencil is very scientific or mathematical, and I take my hat off to the stylists at Rotring, they have really come up with the goods on this one. That hexagonal central section also stops the pen/pencil rolling around on your desk, and adds more weight giving a top heavy feel. The pocket clip is a good solid spring loaded item, no worries there. The grip is OK, about what you would expect from a plain metal finish barrel – it can get a little slippery after extended use. My Trio has black and red ballpoints and a 0.5mm pencil. I believe other configurations are available. As a ballpoint, the refills write well, but they did seem to be the type that collects stuff on the ballpoint so you often get a small blob when you start writing again. It does seem to me that some ballpoints are more prone to this than others, but obviously the paper and other factors are also important. Being a multi-pen, the refills are only very small, probably only holding about 1/10th of a normal pen. Likewise the pencil cartridge only holds 1 or 2 spare leads, but that’s probably not a big deal. I imagine the pen refill size is more of an issue for your average user. To refill the pencil, or replace a pen refill, you have to unscrew the body from the sleeve section to access the cartridges. How do you select the pencil or red or black pen? Well back in 1666 when apocryphal apples were bouncing off Isaac’s head, he got to thinking and came up with the theory of gravity. So, it’s entirely appropriate that the Newton Trio has a gravity controlled selector system. Up at the top of the pen/pencil there are three “dots” (‘black’, ‘red’ and ‘0.5’) set at 90 degrees to each other. You hold the body horizontal with the appropriate dot on top and that’s the tip that will come out when you push the top cap down. Obviously a little weighted spindle orientates the refills inside the body. Very cool. No twisting a section around or anything like that. I am sure the great man himself would approve. If you want the pencil you just hold it so ‘0.5’ is on top and push that big top cap down. There is a little raised button that you push to retract the tip when you have finished writing or want to select a new tip. It is spring loaded retraction, and produces a very satisfying “K-chink” as the tip slams back home inside the body. When you push down on the top cap to extend the selected tip, it’s quite easy for the pens, but you have to push fairly hard to extend the pencil out. The pencil is a push top ratchet, and it’s the same when you use the top cap to activate the lead advance, you have to give it a bit of extra oomph. There is a small “better than nothing” eraser under the top cap, but it’s very difficult to get the top cap off when the pencil is in use because the cap is depressed into the body. You have to retract the pencil tip, and then take the top cap off. Pushing the top cap back on nearly always advances a tip out of the body so you need to be aware of what dots facing up at the time! The Newton Trio comes in a small metal presentation tin - adequate, but nothing fancy. Overall this is a great multi pen/pencil. Best Points – The looks and selector system. Surely Sir Isaac would approve? 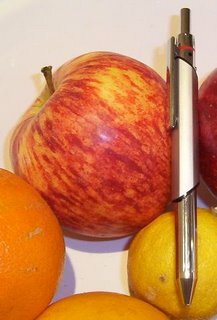 Not So Good Points – The push top ratchet lead advance mechanism is not as sharp and precise feeling as a normal pencil. Dimensions – Length 129mm, diameter 9mm barrel, hex section 11mm across the flats. Balance point about 75mm up from the tip. Well finally of course we need the German / NZ connection for a good German Rotring instrument. 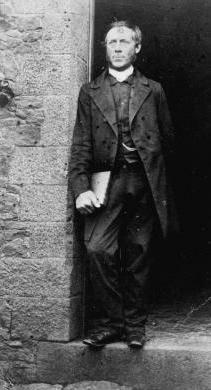 Carl Sylvius Volkner (1819 – 1865) was a German Protestant missionary sent to New Zealand in 1849. During the period of the New Zealand Wars he effectively became a government informant against his Maori parish and certain heretical Christian sects. This culminated in his murder / execution by anti-government forces, and then of course subsequent government military actions to punish the offenders. I've gone through three of the 'Quattro' data pens - similar thing, but without the extra hexagonal section, and with four refils. One is a PDA stylus by default, but you can swap them around to be whatever you want. I had two of them in black, and the black finish wore away quite quickly on both of them. The silver one did fine, though. Unfortunately, they all had a tendency to snap leads almost every time I used them. The problem would go away if I removed the pencil mechanism, and tightened it up, but it would only last through a few uses, then start snapping the leads again. It was actually this that put me off mechanical pencils for years - I was convinced that I was just too rough to be able to use .5mm lead. It's only recently that I've picked up some Pentels (GraphGear 1000 and Kerry, both very nice) that I've realised how *good* a .5mm pencil can be - and they *don't* normally snap in use. Well that's interesting about the Quattro finish, and the lead snapping. On the one hand i haven't had that sort of problem, but on the other I am now thinking that maybe pencil leads in multi-pens do actually snap a little more often than in normal pencils. Something to think about for the future. No "Nova" in NZ as far as I know. On the selector mechanism I've been a bit misleading in the review. Although you can't see, it's actually a little weight or spindle system under the top cap that rotates so that when you push down it pushes out the right refill. The refills themselves are fixed in position. A little story – I am always a bit unsure about getting inside multi pens to refill them as I have had some problems getting them back together and working properly. I purchased this Trio a little while ago from a large chain store. I didn’t check and just assumed the instruction sheet was inside the case. It wasn’t, and it goes without saying that when I went back to the store the school age staff couldn’t find anything as complicated as a piece of paper with instructions on it. So I rang Sanford and asked if they could post or fax me an instruction sheet, but was told that there was no instruction sheet supplied with Newtons! This was obviously nonsense, but they did offer to get someone to talk me through how to refill the pencil cartridge. So I got my verbal instructions, with a denial that it was unusual to supply a quality writing instrument without any instructions, guarantee or paperwork of any kind whatsoever. Needless to say a week later when I was in the chain store again they had a new Newton on sale with a nice little Rotring instruction booklet peeking out of the case! More bizarre multi-national corporation carry on? Apppears some versions of the Rotring Newton / 600 have been re-born as the Parker Facet. Sorry to ask this again, maybe you didn't see it. Does your Rotring Newton Trio have scratches running along the length of the cap? While the scratches are not that noticeable, I find that it protrudes too high for my liking anyway. I am self-conscious when I have it clipped to a shirt pocket. So, if you still have this pen can you please inspect it to see if yours has scratches on the cap, too? Thank you! Hello Wes, I've been away, hence the delayed reply. No, my Newton doesn't have any scratches along the cap. I guess they are from pushing the cap in and out over an extended period of time? 99% of my pencils only ever get used for a week or two as part of reviewing, so I'm never really a good one to comment on long term durability.